Today the GO Team were able to spend the Sabbath worshipping with the church in North Edinburgh. It was lovely to join with both those we had met earlier in the weekend, and those we had not yet met to praise God together. There was something satisfying about looking out of the window to see the tower blocks we had delivered leaflets to yesterday and exciting to think that each home had received the gospel message and information about the church and how God could be working through that. We enjoyed a church lunch in the school after the service which was an opportunity for fellowship together. After this the team enjoyed a chilled Sunday afternoon at Rosie's and a walk to Cramond. In the evening service we looked at what loving each other as a family within the church looks like and looked forward to the church plant becoming established as a congregation later this week. Please continue to pray for the church as they become established as a congregation, for their fellowship as a community of believers and for their outreach to the surrounding community. Please also pray that God would give safety to the members of the GO Team as they travel home. We give thanks to God for all that the team has been able to achieve this weekend and for the various ways in which He has answered prayers. It has been such a joy and privilege to be able to spend time with the church in North Edinburgh and we look forward to hear what God does in the future in this part of the city. Today was another busy day of leaflet distribution around North Edinburgh as the GO team were joined by others from both Edinburgh and Glasgow. Give thanks for how we continued to make good progress throughout the morning and afternoon with the leaflets; of the 7500 we hoped to give out, only 350 are left! It was a day of new experiences, with some GO team members enjoying views over Edinburgh from 22 storeys up and others learning the art of cheese slicing with a cheese plane (slicer)! We have been constantly reminded of God's goodness to us - from two days of beautiful sunshine to being able to access most flat blocks, God has answered many prayers. We are also thankful for the good relationships he has given us within the team. Please pray that people in the community would read the gospel message they have received and that the Holy Spirit would work in people's hearts. Pray that we will see new faces in the church services tomorrow and for Peter as he preaches. This morning a team of eight enthusiastic go teamers arrived in Edinburgh, some after an early start for a flight, to serve alongside the group in North Edinburgh, a church plant in a more socially deprived area of Edinburgh. The team consists of members from both Northern Ireland and Scotland, and we were also joined by several people from the North Edinburgh congregation. Team members are: Ken Nelson, Sarah-Jane Wilson, Calvin Quigley, Jess Muir, Anah Laverty, Anselm McDonnell, Abigail McLean and Esther McCollum. After a quick introduction and breakfast of bacon butties together at Peter and Emma's, the team headed out to make a dent on the 7500 leaflets to be given out. The leaflets have a heading of 'What has God to say to you?' and look at the theme of how although we can change many external factors in our lives (new houses, new jobs new relationships etc) we cannot deal with our hearts and we need the good news of Jesus Christ to change our hearts. We enjoyed lunch together and then more distribution. Really good progress was made and we covered all of the areas we were hoping to cover and more. 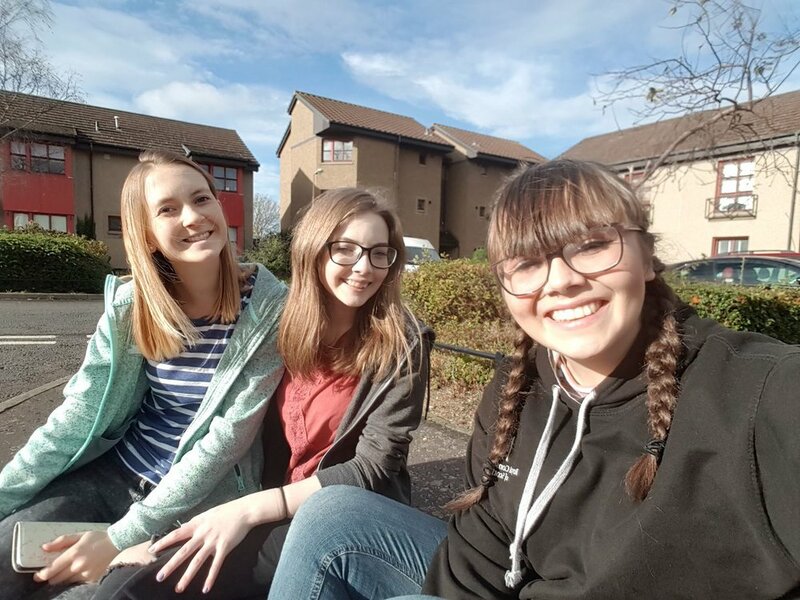 We have already seen answers to prayer in that we were able to gain access to the majority of the flats we were hoping to get into and that the weather was so lovely throughout the day. We enjoyed a time of team prayer and worship this evening which was a great opportunity to thank God for the day and pray for the surrounding community that people's hearts would be open to the gospel message they receive and the invitation to attend church. Continue to pray for good weather tomorrow and that we would continue to be able to gain access to the majority of flat blocks and that people would read the leaflets and God would work in people's hearts and also for more conversations with people we meet.